Everything I want detective novels to be but rarely are -- paranoid, surreal, cynical, philosophical, but, above all, entertaining. Piglia's world is fully formed and constantly peeling back layers of complexity and intrigue. My favorite book of 2015. A passionate political and psychological thriller set in a remote Argentinean Pampas town, Target in the Night is an intense and tragic family history reminiscent of King Lear, in which the madness of the detective is integral to solving crimes. 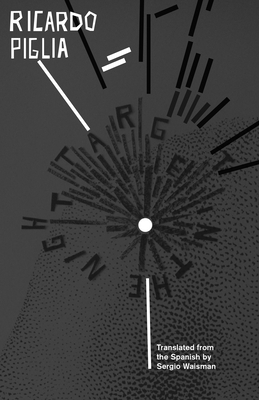 Target in the Night, a dark, philosophical masterpiece, won every major literary prize in the Spanish language in 2011. Ricardo Piglia (b. 1941), widely considered the greatest living Argentine novelist, has taught for decades in American universities, including most recently at Princeton. Ricardo Piglia, one of the most prominent authors of the entire Spanish-language world, was born in Buenos Aires in 1940 and grew up on Mar del Plata. He studied at the Universidad Nacional de la Plata where he majored in history and graduated in 1965. Early in his career, Piglia was connected to the important literary and political magazine Los Libros (1968-1974) and in 1968 began the publication of his first edited collection of detective novels: La Serie Negra. Piglia also established himself as a writer of short stores and was the recipient of distinguished awards. His fiction grapples with the meaning of social and political processes as is evident in the stories collected in the volume Assumed Name, published in English in 1995. Two of his books (Assumed Name and Plata quemada) have inspired films. His novel La ciudad ausente was adapted for opera and shown at The Colon Opera House of Buenos Aires, with music by Gerardo Gandini. He received innumerable prizes for his works and for his lifetime's body of literature, including the Casa de las Americas Prize for La invasion, the Boris Vian Prize for Artificial Resperation, the Nacional Prize for La ciudad ausente, the Planeta Prize for Plata quemada, the Premio Iberoamericano de las Letras Jose Donoso, and for Target in the Night the Romulo Gallegos Prize and the National Critics Prize.A literary critic, essayist, and professor, Piglia taught for several decades at American universities, including at Princeton for fifteen years. As professor, Piglia teaches Spanish American Literature, with special emphasis on 19th and 20th centuries intellectual and cultural history in the Rio de la Plata. Interested in literary theory and theory of the novel he has given seminars about Sarmiento, Onetti, Borges, Arlt, Puig, as well as on "Paranoid fiction. The detective genre in Latin American" and "Poetics of the novel in Latin America. He currently holds the Walter S. Carpenter Professor of Language, Literature and Civilization of Spain at Princeton. Sergio Waisman is Professor of Spanish and International Affairs at The George Washington University, where he has been teaching since 2003. He is also Affiliated Faculty of Judaic Studies. He received his Ph.D. in Hispanic Languages and Literatures from UC Berkeley (2000), and an MA in Creative Writing from the University of Colorado, Boulder (1995). Prof. Waisman's book Borges and Translation: The Irreverence of the Periphery was published in the US by Bucknell and in Argentina by Adriana Hidalgo (both in 2005). Sergio Waisman has translated six books of Latin American literature, including The Absent City by Ricardo Piglia (Duke Univ. Press), for which he received an NEA Translation Fellowship Award in 2000. His first novel, Leaving, was published in the U.S. in 2004 (Intelibooks), and in 2010 as Irse in Argentina (bajo la luna). His latest translations are The Underdogs by Mariano Azuela (2008, Penguin Classics) and An Anthology of Spanish-American Modernismo (2007, MLA, with Kelly Washbourne).